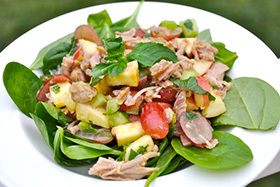 Fresh orange juice, mint, apple and grapes make this turkey salad something special. This recipe is perfect to use leftover roasted turkey from your holiday meal, or even leftover chicken. Be sure to use organic ingredients to get the most flavor and nutrients.